Moravian Duets, a popular composition that was originally intended for home music-making, won young Dvorak a scholarship and relieved him of financial worries; after the composition was published by Simrock, it also launched Dvorak's international career. Shortly after their publication, Janacek arranged six duets from Op. 29 and Op. 32 for four-part mixed choir using Dvorak's piano accompaniment. Janacek thus extended the choral repertoire by adding six highly rewarding pieces which are included in this edition. 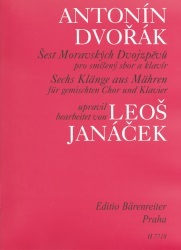 The basis for this edition is Janacek's choral score published in 1939 by Josef Plavec. The piano part, Czech text and German translation by Kurt Honolka were taken, without any changes, from the Complete Critical Edition of Works by Antonin Dvorak.